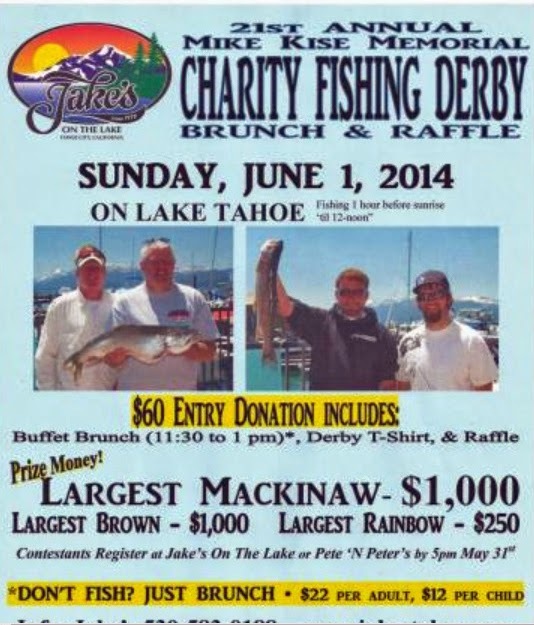 The 21st annual Jake's Charity Fishing Derby has been renamed to the Mike Kise Charity Fishing Derby in honor of the long time manager of Jake's On The Lake and co-founder of the fishing derby. For a $60 dollar donation, anglers will be given a T-shirt, Raffle, and a buffet brunch. Proceeds from the derby will be given to the non-profit North Tahoe Booster Club. The Lake Forest boat launch ramp in Tahoe City will be open early for derby participants and launch fees will be waived. You still need to have a current boat inspection to launch. Jake's On The Water is located at 780 North Lake Boulevard, Boatworks Mall, in front of the Tahoe City Marina. Weigh-in and brunch will be on the Grove Street pier at the southwest crib of the Tahoe City Marina. For food and fun without the fishing the price is $22 dollars for adults and $12 dollars for children. Register by May 31 at Jake's or Pete and Peter's.